Be it her super-fit body, flawless natural beauty, perfect makeup or anything else, the Begum of Bollywood, Kareena Kapoor Khan, has a lot that makes everyone go crazy for her. And, it is not just the men who get awestruck by this diva’s charm, but even the girls look up to Kareena as a style inspiration! Yes, when it comes to clothes, we look up to either big designers or our favourite Bollywood celebs for some serious dose of inspiration. Then imagine the magic that will be created when one of the most stunning and beautiful divas of Bollywood, Kareena Kapoor Khan, and some of the best designers of the country will join hands? The Nawab of Bollywood, Saif Ali Khan, walked the ramp with his ‘then girlfriend and now Begum’, Kareena, at HDIL India Couture Week in Mumbai on October 14, 2009. Needless to say, both of them looked simply stunning in the ace designer, Manish Malhotra’s creations! 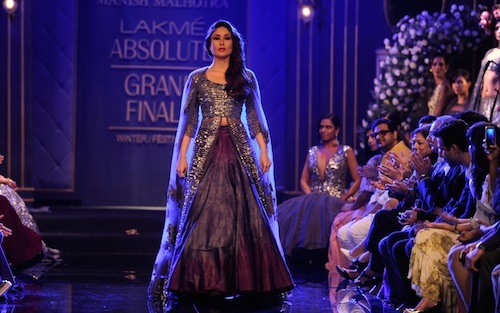 Kareena once again walked for her favourite designer, Manish Malhotra, at the LFW Winter Festive 2011 grand finale. The combination of the custard apple shade with silver looked nothing but the best on this diva. She simply looks like a fairy who just came straight out of a fairytale, don’t you agree? 3. Monochrome at its best! Kareena looked simply fab as she walked the ramp for the designer, Kallol Datta, in a monochrome long jacket teamed up with a pair of black leggings and a black bustier, at the grand finale of Lakme Fashion Week Winter-Festive 2012. 4. Fringes were never so hot before! The scintillating diva was the showstopper for the designer duo, Pankaj and Nidhi, at the Lakme Fashion Week Winter-Festive 2012. She wore a beautiful black outfit that had infusions of leather and long fringes. 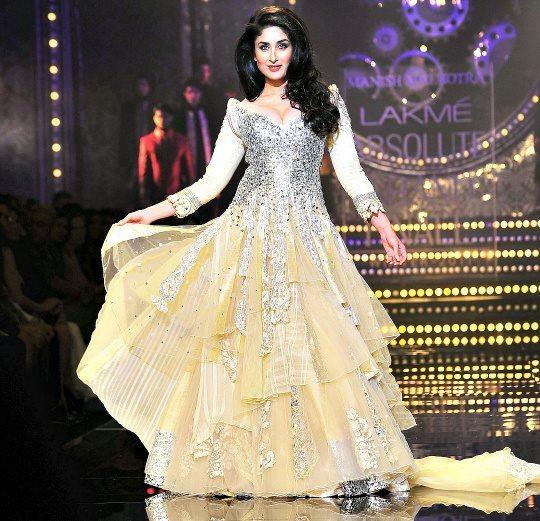 Bebo was the showstopper for Lakme Fashion Week once again in 2014. She donned a black and silver dress by the designer, Rajesh Pratap Singh. And, we totally loved her entire look as she teamed up the stunning outfit with a neat hairdo, metallic eyes and subtle lips. 6. Going by the Roman style! Lakme’s brand ambassador, Kareena, walked the ramp for the famous designer, Anamika Khanna, at Lakme Fashion Week Summer Resort 2015. The toga dress that she wore was absolutely stunning. And, she upped the glam quotient further by pairing it up with bold red lips, a neat bun and beautiful earrings! 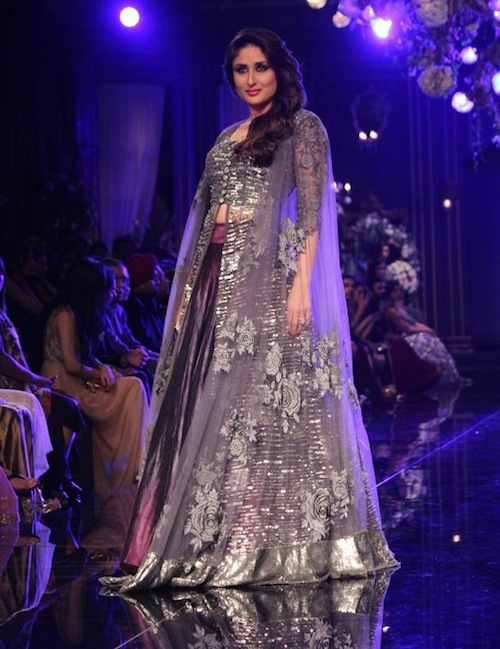 It was simply a delight to watch Kareena walking the ramp in one of the most stunning creations by Manish Malhotra. The diva looked ravishing in a metallic purple lehenga, which also had a jacket and a net dupatta over it. And, we totally fell in love with her smoky eyes and pink lips! So ladies, weren’t these looks superb and would you not want to don all of these at some or other occasion to look just like this diva? Well, do let us know in the comments section below about which is your favourite!